The Secondary Classroom can be fun too.....: A Fantastic 100th Post for a Fantastic Four Warm Up! A Fantastic 100th Post for a Fantastic Four Warm Up! Hello! I'm proud and delighted to announce that this is my official 100th published post (a few more have been created but aren't to my standards yet). 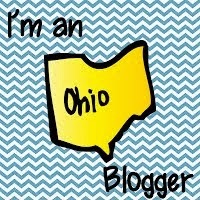 I am so excited :) It was my goal this year to do more lessons this year that could be considered "blog worthy" and I feel like so far, I'm able to post a lot more this year! It also probably helps that I am no longer a first year teacher! Currently, I'm away from school running some PD sessions and I heard this really cool idea in a classroom that I was observing. Mrs. Reid has her kids do a Fantastic Four or Fantastic Three Warm Up each week. Well, this year, it has been on my to do list to create a daily warm up. Finally, I've found/heard my inspiration! Ta da! 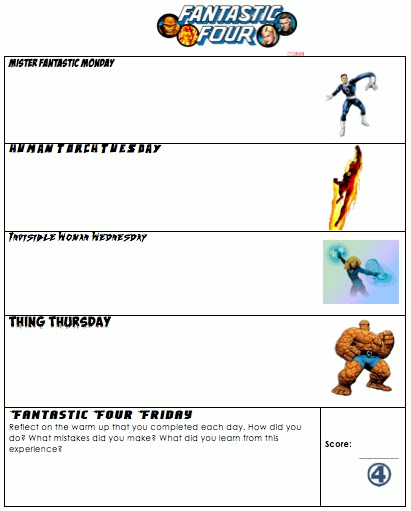 I've created a Fantastic Four Warm Up worksheet complete with a character themed day along with work space allowing for the kids to write down the problem and show all their work. Monday is called MISTER FANTASTIC MONDAY and you have THING THURSDAY, you know, goofy me. Anyways, I'm aware, there are more than 4 days in our school week leaving us with Fantastic Four Friday. I've reserved the space in Friday for a reflective piece where the child writes a few sentences about how they felt their warm ups when this week / what they learned from the experience / etc. They also keep track of their score out of 4. It'll be my intent, next semester, to utilize this each week with a question for each day. Disclaimer: I do not own Fantastic Four, it is a product of Marvel. Nor could I ever have the ability to create these images, again, all the wonderful artists out there. So per usual, I will not profit from this worksheet and have it out there purely for you to enjoy!